Q: Why do consumers choose engineered hardwood? A: Amongst several reasons, consumers choose engineered hardwood for its authentic wood finish and astonishing durability. Unlike traditional hardwood, engineered can go in rooms that you never imagined possible. 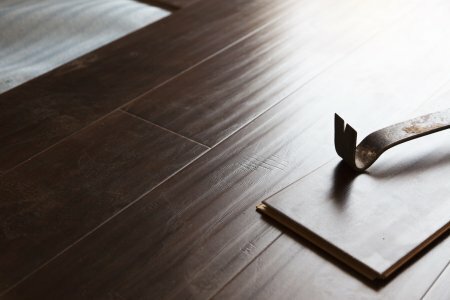 Homeowners can now install hardwood floors in areas that attract a lot of moisture like bathrooms and kitchens without the fear of warping or damage. Q: Is engineered hardwood long-lasting? A: Absolutely! Engineered hardwood can be sanded and refinished several times throughout its lifespan to keep it looking beautiful. Plus, with a tough top layer, engineered hardwood is resistant to scratches and dents, helping to keep it around for years to come. Q: What is the style range for engineered hardwood? Am I limited? A: You are absolutely not limited to choices with engineered hardwood. Much like traditional hardwood floors, you can select from an array of different plank widths, wood species, colors, textures, and styles. Q: How long will the installation process take? A: Installing engineered hardwood is fairly quick. Prior to installation, you will need to allow time for clearing the room of furniture, removing your current flooring (depends on material), cleaning your subfloor, allowing your subfloor to dry and preparing the underlayment area. For a specific quote for your home, please call or visit one of our beautiful showrooms. Q: Where can I install engineered hardwood? A: You can install engineered hardwood in areas that you cannot typically install traditional hardwood like basements, laundry rooms, kitchens, and bathrooms. 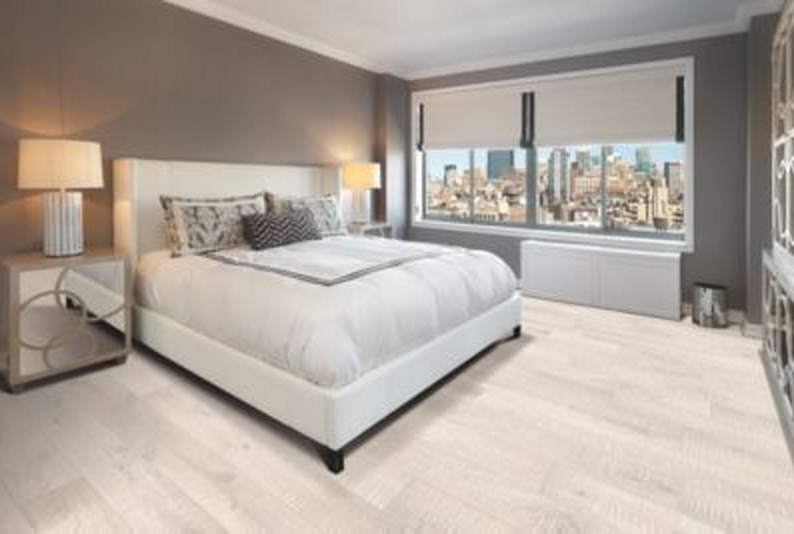 Engineered hardwood does well against moisture and humidity, making it an excellent choice for humid and moist rooms. Q: What makes up engineered hardwood? A: Engineered hardwood consists of several layers. Your top layer is 100% natural wood. The next layer is made up of five to seven layers of plywood that lay in different directions. The last layer is also wood. Q: What type of wood species are available? A: Engineered hardwood ranges from Oak, Maple, and Hickory to softer species like Birch, Cherry and Walnut, and even exotic woods like African Mahogany, Acacia and Tigerwood. Do you have more questions about engineered hardwood? Give us a call or visit for more information. 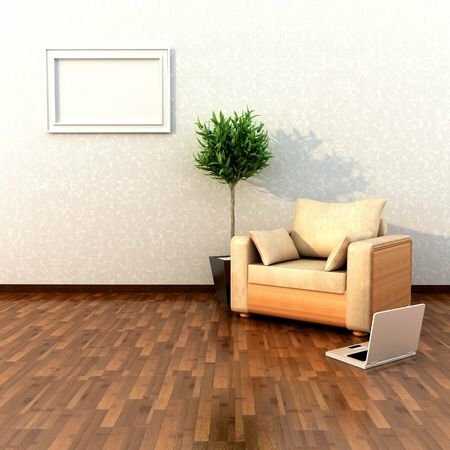 You invested a lot of money into your gorgeous hardwood floors and for them to last a lifetime, they need to be properly cared for and maintained. To help homeowners in the maintenance process, we collected ten must-follow rules for the best success. Let’s take a look! Natural wood originates in a climate of 60 to 80 Fahrenheit with 35%-55% relative humidity. It is essential to always have on your HVAC system in order to maintain the proper temperature. It is important to sweep/vacuum your hardwood floors regularly to increase their longevity. Just be sure to only use a brush head or felt tip. You want to avoid beater bars as they can damage your floors. To keep your floors looking beautiful longer, you need to take action as soon as you see a spill or accident. It is important to wipe the mess up with a soft, white cloth and the recommended cleaning products. For a list of recommendations, please visit your hardwood flooring manufacturer’s website. No. Four. NEVER Use Water. Wood and water just do not mix. It is best to avoid water altogether when cleaning your hardwood floors. No. Five. Know Your Products. Products containing oil soaps, liquid or paste wax products, lemon oil, tung oil, or ammonia should be avoided when cleaning your hardwood floors. No. Six. Trim Pets’ Nails. Keeping your pets’ nails trimmed can be good for their overall health as well as your floor’s health. While long nails can cause scratch marks, they can also potentially hurt your animal and cause them pain. It is best to keep your pets’ nails trimmed and cleaned. No. Seven. Use Floor Protectors. Floor protectors can be a great aid for heavy furniture and appliances. Just be sure to buy flooring protectors with no dyes. No. Eight. Avoid Wearing Shoes. High heels and spiked shoes can be hardwood floor’s worst enemy. To avoid damage and tracing inside lingering dirt, you can establish a “no shoes indoors” rule. No. Nine. Place a Doormat at Entrances/Exits. Cut dirt and debris off at the source—the doorway. Place a doormat in front of entrances and exits of the home to avoid tracing it inside of your home. Also, it can be a smart idea to place mats outside of your bathroom and near the sink in the kitchen. These areas typically attract water which is hardwood’s enemy. No. Ten. Always use a White Cloth. You never want to use a dyed or colored product on your hardwood floors because it has the potential to transfer. Instead, opt for a soft, white cloth to get the job done. Are you interested in learning other ways to care for your other types of flooring? Be sure to check out our other posts at https://blog.century-tile.com. Still in limbo about what type of flooring you’re going to install in your home? Well, let us help you. Here are five reasons why you should opt for hardwood flooring. Many homeowners steer away from hardwood floors because they feel that it would be too difficult to maintain. This is a common misconception. Wood floors are not difficult to clean. They don’t trap dirt, debris any other type of contaminant because it doesn’t have fibers. You can easily remove dust by taking a hard bristle broom or vacuum to the surface. To maintain that glossy or matte finish you can create a mixture of your favorite wood cleaner and buff the floors every six months. That doesn’t sound hard, does it? Want to create a distinct look in your home? You don’t have to stick to dark wood grains. There are many different types of woods on the market with characteristics and colors that set each one apart from the other. You can also narrow your choices down based on the grade of wood. Based on your decor and preference you can select narrow or wide wood planks. Your options are numerous. Unlike most flooring types like carpet and vinyl that require replacing every few years, hardwood floors can last a lifetime. Wood floors are such a great investment because if you can care for them they won’t show extensive wear which means if you decide to put your home on the market in the future you won’t have to install new flooring. Carpet flooring attracts dust, mites and other allergens. If you’re especially sensitive to allergens then you might want to go with hardwood flooring since it doesn’t host harmful allergens and contaminants. Often, the main reasons homeowners don’t opt for hardwood flooring is because of its generally more expensive than other flooring options. Since hardwood floors increase your home’s resale value, you will get a return on your investment. According to real estate experts, homes with hardwood floors tend to sell a lot faster. Are you searching for the perfect kitchen floor for your home? Laminate flooring in the kitchen is an excellent choice for many reasons such as versatility, easy maintenance, reasonable pricing, durability, easy installation, and it is excellent for air quality. First, laminate is quite versatile; it is available in a wide variety of tile choices, faux wood, different colors, thickness, surface treatments, and plank styles. 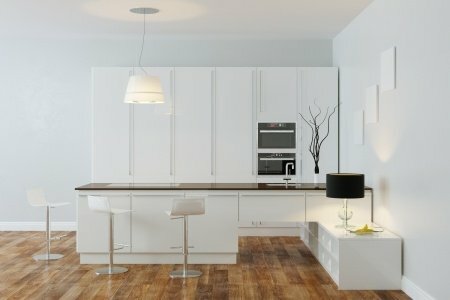 Do you have a flair for decorating, or do you have a picture in your mind of the perfect design for your kitchen. Laminate flooring’s versatility makes it a great choice for decorating because of the vast amount of choices. Laminate flooring is also easy to maintain. It can be cleaned with a damp cloth or dust mop. It is also moisture and stain resistant. Next, laminate flooring is a reasonably priced choice compared to other flooring options. It is more affordable than hardwood, luxury vinyl tile, and other common flooring choices. It is also very durable. Laminate flooring is scratch resistant, and protected by a resin coating and a tough external layer making it highly durable. It is a great choice for home with pets and children because of the high amount of traffic the floor will take. Another advantage is that laminate flooring is easy to install. Laminate boards are designed to interlock, making it much easier to install than other flooring. The fact that it can be floated over most existing flooring also makes it a time saver when installing. Other flooring options can take longer to install, and some need to be nailed down, stapled, or glued. Finally, laminate flooring is a great option for people with allergies. There is no place to trap particles and dust on laminate floors. A moisture barrier that protects the floor from damage and prevents mold from forming is provided by the underlayment. These are just a few of the reasons laminate flooring is an excellent choice for the kitchen. Please contact us with any further questions or concerns. There are a lot of decisions to be made when selecting hardwood for your floor. Do you want a natural finish or a stain? What about solid or engineered construction? Are you going to purchase pre-finished floor boards or have your installer finish them after installation? Included in all of these choices and decisions is whether to use a domestic hardwood, or an exotic one. While the name “exotic” implies something very different, unusual, or foreign, in this case it merely refers to any hardwood not harvested in the US. You have a lot of different wood species to choose from regardless of which category you pick, but having some information about the two basic groupings can help you make your decision. You’re probably the most familiar with domestic hardwoods. Red and white oak, maple, hickory, birch, beech, elm, pine, and cherry are all domestic hardwoods. They vary tremendously in color, grain pattern, and in hardness, but because they have been in use in the US for so many years, they often give an appearance of tradition to a home. For example, wide pine planks are often used in farmhouses, while maple is most often seen on basketball courts and dance studios. Far and away the most popular domestic hardwood is red oak. It has a warm, creamy tone that ranges from pink to red with lots of gold mixed in. The grain is even and consistent, like most domestic hardwoods, excepting hickory, and it’s a fairly hard and durable wood. Hickory is the hardest and most dramatic domestic wood, but even this is still fairly consistent in grain and color – in other words, you know what to expect from lot to lot. Exotic hardwoods are often much harder and more durable than domestic. Brazilian cherry, for example, is much harder and richer in color than American cherry. Brazilian walnut is also much harder than American walnut. Exotic hardwoods are also often very dramatic in their coloring and grain pattern. These hardwoods are meant to be noticed. They are often more costly than domestic woods, because of the cost of shipping, but this cost is often offset by the dramatic color and rich veining they posses. If you want a traditional looking wood floor that will be the backdrop to the rest of your décor – opt for domestic. For those that want the floor to become the centerpiece of the room – exotic may be the way to go. Hardwood is a beautiful choice for any home, no matter the interior styling. However, because there are so many wood species and stains to choose from, it can be a tough decision. Look no further! We think you will fall in love with a gray or white wash finish option! White wash or white wood or gray stains are a great choice if you desire a lighter, more modern look. These floor stains are being installed in many places in the interior design world, magazines and on design television shows. There is a reason so many designers are choosing this fresh finish for their hardwoods. 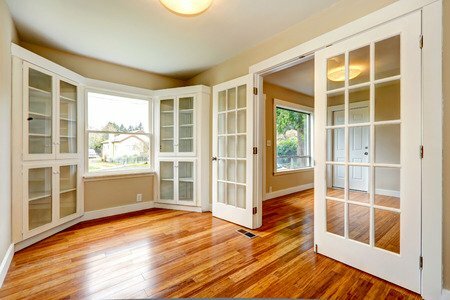 A lighter finish for wood floors looks bright and makes a room feel fresh. This type of stain option is perfect for homes that need more light. Dark or medium wood colors tend to look quite traditional. Selecting a more modern stain can transform the look of the hardwood in your home. White or gray wood or white wash works with many different styles! There is no need to worry about the color scheme with this finish. It is a fresh neutral that looks good with all colors. 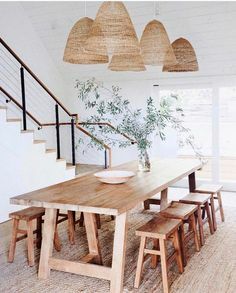 The contrast can be played up or down between other wood furniture as well. This trend works for many different types of interiors; modern, contemporary, rustic, shabby chic, and the list goes on. 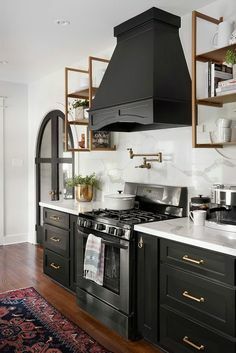 The only time to stay away from this particular look is when trying to stay true to a historical look, or in a very traditional space. There is a reason these finish options have spread like wildfire. Because it looks beautiful and meshes well with all other color schemes. 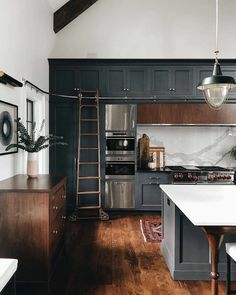 Even if the floors are light the rest of the space may be dark in contrast. These colors for hardwood floors are quite versatile. Keep this in mind when selecting new hardwood floor options! 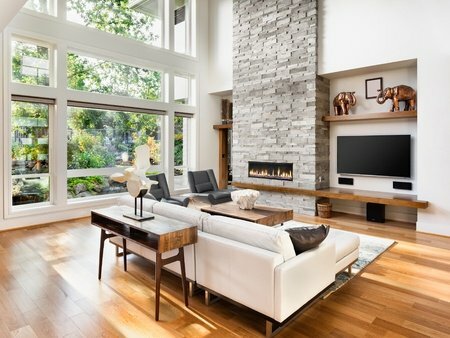 If you have any questions about this wonderful look, feel free to ask us at Century Tile! We are always happy to help.